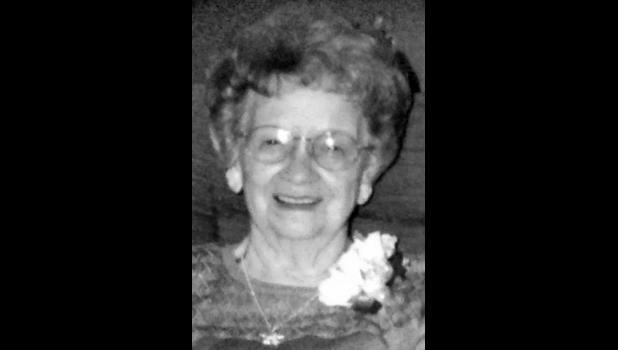 Delores D. “Granny” Schlodder, 86, of Holton, passed away Mon­day, Nov. 24, 2014, at The Pines in Hiawatha. She was born April 12, 1928, in Wetmore the daughter of Herbert C. and Beryl E. (Williams) Kling. Delores graduated from Wet­more High School in 1946 and was a lifelong resident of Holton. She worked at Kansas State Bank (now Holton National Bank) as book­keeper and later assistant vice president in charge of operations, retiring after 30 years. “Granny” had published two books, “All About Adam” and “Granny’s Reci­pes.” Into retirement, she cooked, baked and catered for family, friends and the community. Delores was a long-time member of the First Christian Church in Holton, serving as Sunday school teacher, Elder, Youth Leader, Dea­con and Treasurer. She also served on the Worship Committee, Chris­tian Women’s Fellowship and sang in the choir. She was also a mem­ber of Holton Business Women. She married John “Johnny” Schlodder Jr. on Sept. 10, 1947, in Holton. He preceded her in death on March 16, 2004. She was also preceded in death by a son, Alan Schlodder on March 31, 2014; four sisters, Madeline Wolfe, Inez Lar­son, LaVerne Bell and Mary Helen Musick; and six brothers, Francis, Clifford, Ernie, Clinton, Delmas and Kenneth Kling. Survivors include a son, Tim Schlodder (Nancy) of Holton; a daughter, Carol Voigts of Hiawatha; a daughter-in-law, Connie Schlodder of Holton; nine grandchildren, Adam, Heidi and Holly Voigts, Kyle Schlodder (Crystal), James Schlodder, Joh­nathan Schlodder (Kristel), Chris­tina Murphy (Jason), Pamela Schlodder and Melissa Norris (Heath); and 11 great-grandchil­dren. Funeral services will be held at 10:30 a.m. Friday, Nov. 28 at Mer­cer Funeral Home in Holton. Burial will follow in Holton Cemetery. Family will greet friends from 5:30 p.m. to 7 p.m. today at the funeral home. In lieu of flowers, the family suggests memorials to First Chris­tian Church, sent in care of Mercer Funeral Home, P.O. Box 270, Holton, KS 66436.